China plans to launch the first module of an envisioned space laboratory by the end of September, and the rising space power will attempt its first in-orbit docking weeks later, according to space program officials and state-run media reports. 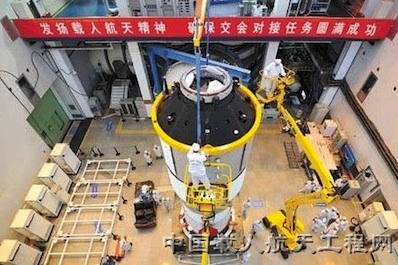 The Tiangong 1 space module was shipped to the Jiuquan launching base June 29 to begin the last steps in preparing the craft for launch sometime before the end of September, according to the China Manned Space Engineering Office, an organization supporting planning and development of the country's human space efforts. The spacecraft will be given a "final check" before blasting off on a Long March 2F rocket from Jiuquan, a space center in the Gobi desert in northwestern China. The launch site is near the border between China's Gansu and Inner Mongolia provinces. "After two years of strenuous efforts by the scientists, [the] Tiangong 1 target spacecraft has been successfully assembled and passed through failure detection," the state-run People's Daily newspaper reported in its English edition. Xinhua, another state-run news agency, also reported last week the Tiangong 1 spacecraft was transported to the launch site. The 19,000-pound vehicle is designed to function as a testbed for Chinese rendezvous and docking techniques a few hundred miles above Earth. China says it will operate for at least two years. Tiangong, which means "heavenly palace" in Chinese, features a forward docking port, navigation and communications equipment, and a pressurized cabin for human visitors. An automated Chinese capsule named Shenzhou 8 will launch as soon as October to approach and dock with the Tiangong module. If the rendezvous attempt is successful, it will pave the way for up to two manned Shenzhou flights to the mini-space station in 2012. The piloted missions could stay at the complex for days or weeks working on scientific experiments, military missions and other research for China's military-run space program. 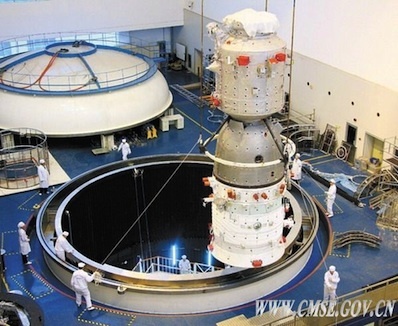 China's next five-year strategic plan includes manned space missions spanning at least 20 days and the design and construction of an automated cargo craft to resupply outposts in orbit, state-owned media reported this spring. The advances come as the United States retires the space shuttle and struggles to formulate a consistent policy regarding cooperation with the Chinese space program. NASA Administrator Charles Bolden visited China in October 2010, but a clause inserted into the agency's budget this year sought to limit NASA's ability to collaborate with the Chinese government or companies. Rep. Frank Wolf, R-Va., is a staunch critic of China's human rights record. Wolf was instrumental in ensuring the China restrictions made it into the budget. Although many lawmakers support Wolf's provision, some members of Congress show guarded support for modest cooperation between NASA and China, including the development of a joint docking system to facilitate rescues of international space crews. An Obama administration official told Congress in May the White House's view of the issue was that the legislation should not interfere with the president's constitutional ability to conduct international negotations. The Tiangong docking test this fall is a key milestone for China's objective of building a space station the size of NASA's 1970s-era Skylab outpost by 2020.